What is your favorite way to celebrate summer? We've been enjoying a very mild summer her in Washington, which has involved a lot of grilling. And where there's grilling, there's outdoor eating, which is giving me the perfect opportunity to use my new awesome Entertain-a-Bowls and Fruit & Veggie-tainer that Snapware sent me to try out. Now I love trying out new products and I already love Snapware, so this seemed like a great plan to me. The bowls come in three different sizes, all of which nest in each other for easy storage, and I absolutely love love love the colors (bright yellow, hot pink, and turquoise). I needed happy bowls. 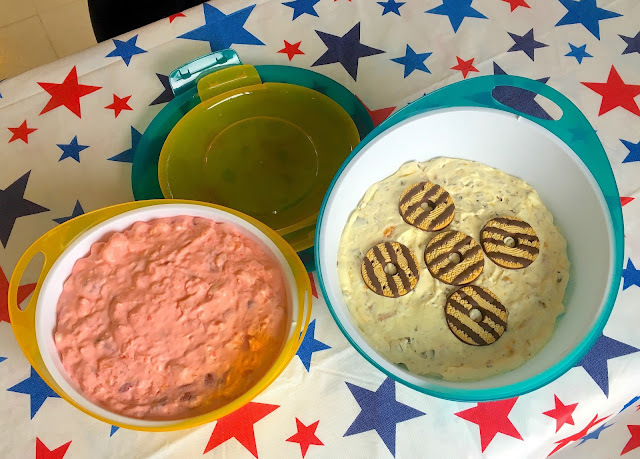 We had a 4th of July barbecue to attend, so of course I had to fill them with yummy dessert salads--Strawberry Fluff Salad and Mandarin Orange Cookie Salad. I also have the new Fruit & Veggie-tainer which is perfect for parties with the dip container in the middle. I also think it would be awesome to have in the fridge with lots of cut up fresh fruits and vegetables ready to go. My kids eat so much more of these when they are easily accessible. Want a set of Entertain-a-bowls and a Fruit & Veggie-tainer? You can win one! Just use the Rafflecopter below to enter, open to readers in the US and Canada! Disclosure: Snapware (World Kitchen LLC) provided me with Entertain-a-Bowls, a Fruit & Veggie-tainer, and compensation for this post. All opinions are my own. I always bring a farro salad to barbecues in the summer. I would definitely use these to hold my delicious farro salad. Home made coleslaw is perfect side for BBQ pork sandwiches! Summer barbecue for me means grilled veggie tikkas ! These bowls look amazing! For barbecues I love making pasta salad or strawberry pretzel salad. Oh man! These look great, and great for taking things to other people's houses for parties! For a summer gathering I like to make a fruit salad with a yogurt dressing. I always love baked beans and corn on the cob. I like to make BBQ Chicken, Coleslaw and a fresh fruit salad. This would be great for the cookouts I want to start having at my new apartment!!!!! Oh I love the handles! Such a great feature on a bowl to take with you - living in a city, I always walk to a friends house and it can be annoying to carry a regular bowl! This summer has been homemade ice cream! A cheese ball with crackers. These look so helpful...and I love the bright colors! I like to make corn and bean salads at BBQs! I like to make corn dip for summer bbq's. Veal chops on the grill. I always bring a vegetarian dish with some kind of protein in it like quinoa. we like to bring a mango avocado salsa dish! When I think of Summer BBQs, after I think of the actual BBQ, I think of potato salad! I might make good German Potato salad or classic American Potato Salad.